Rowdy Welles (Davi) is a badass named Rowdy Welles. He’s a flying ace that loves planes as much as he loves women, cigars, and being named Rowdy Welles. When a suit at the CIA named Althorp (Gazzara) frames Rowdy for murder, Rowdy has no choice but to do his bidding. (i.e. the “just do this one job for me” plot which may seem familiar.) 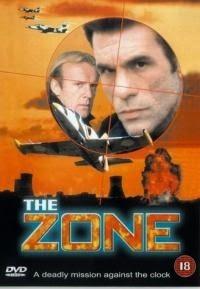 His mission is to travel to Russia, and stop the nuclear ambitions of a baddie named Lothar Krasna (Godunov). His name is as evil-sounding as Rowdy’s is awesome. While there, he gets up to all sorts of intrigue and shenanigans, many of which involve the beautiful Mikaela (Harris). Will Rowdy stop the entire Russian nuclear program with only a toy car? Find out today! 1995 was an amazing year for the great Robert Davi. He starred in this, No Contest (1995), Showgirls (1995), and one of his career best, The Dangerous (1995), among even more film and TV appearances. It’s easy to forget these days that Davi was a big star, or at least poised to be one, in the DTV world. Regardless of his status, we remain staunch Davi fans, and while it was only natural not everything he did in ‘95 would be as good as The Dangerous, Davi still carries the movie, and looks cool smoking a cigar and/or shooting people in slow motion. 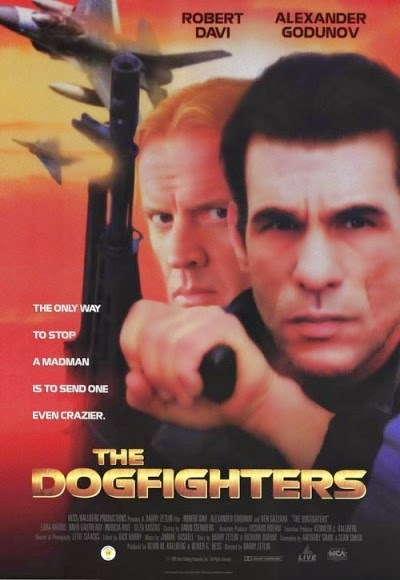 While some of the weirder elements kept The Dangerous afloat and made it memorable, The Dogfighters is merely a “guy in a foreign land beating up foreigners” movie that we’ve all seen before. But at least it’s not a plane slog like we thought it was going to be. Granted, the beginning-and-end brackets of flying scenes go on too long (as do many other scenes), but we do have one of the better exploding helicopters in recent memory, so there’s that. Plus, Godunov is just not that threatening in this movie. Yes, he does have the typical long blonde hair that alerts us that he is a typical Eurotrash baddie, but he’s busy dancing (they made sure to give him at least one unnecessary dance scene), and not putting Rowdy’s family at risk, or anything like that. History-wise, The Dogfighters is a movie trapped between the 80’s and 90’s. For example, there are references to “finishing the job” with Saddam Hussein and the first Gulf War, and another beaming picture of Bill Clinton firmly placed on the wall (though not as prominent as it was in Terminal Rush), yet the Russians are still the villains, just like they were in the 80’s. Fascinatingly, Ben Gazzara makes a reference to having “enough explosives to take down the World Trade Center”. While the first WTC bombing had already occurred, still that should be enough to ban the airing of this movie on TV, along with the forbidden episodes of Seinfeld and The Simpsons. (Interesting connection to that: Dan Castellaneta is credited with “additional voices” on this movie). But really, this movie is just dumb, and loses energy a lot. It needed more action, and lacked a sense of urgency or danger. Plus Godunov looks like, and is about as threatening as, Gerard Depardieu. Also the music by the normally-great Jeff “Skunk” Baxter seems listless and noodly, not driving and action-oriented like it should be. The “not theater-ready” look to the project inevitably alienated potential renters, who were spoilt for choice during the height of the video store era. Thus, fairly or unfairly, The Dogfighters is sadly condemned to the lost video store shelf of history.